In addition to accessing your Web24 cloud server remotely, you can using the Remote Desktop Connection program to copy files from your machine to the Web24 server. Note: This method should only be used to transfer a small amount of data. Security warning: If your local machine has any virus/malware, using this method may infect your server. Use this method with caution. As always, we recommend you have antivirus software on your VPS hosting system. It is good practice to disable the resource sharing once you have copied the data across. 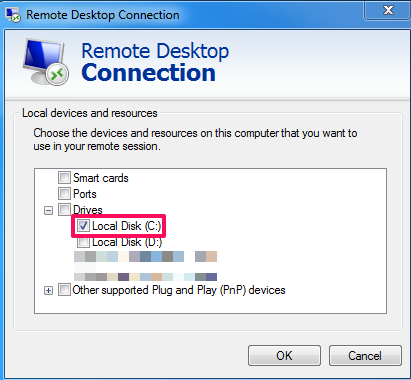 In the Remote Desktop Connection window, click on Show Options. Click on the More button in Local devices and resources section. Expand Drives and check the checkbox corresponding to the drive you wish to share and click OK.
Go back to the General tab in Remote Desktop Connection and connect to your Web24 server. Open My Computer on the remote server to see the shared drive.